In March of 2013, it was announced that The Great Lakes Shipyard would be handling the repair contract for one of the cutters – the USCGC NEAH BAY. The 660 ton NEAH BAY is the 5th in the Bay-Class of ice breaking tugs and is home ported in Cleveland, Ohio. With the capability of breaking ice up to 20 inches thick, this vessel assists in keeping the various rivers that attach to the five (5) Great Lakes clear of ice. In addition to its ice breaking duties, the USCGC NEAH BAY is involved with Search and Rescue Missions, Law Enforcement and Public Affairs during the summer and fall months. 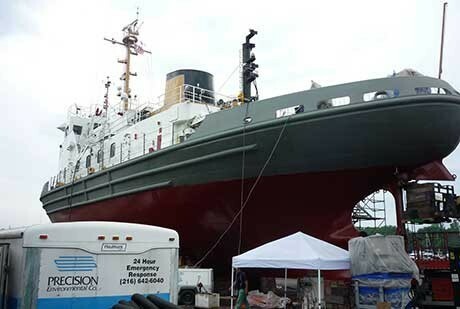 Precision Environmental’s experience and range of services was relied upon to handle the paint abatement throughout various portions of the USCGC NEAH BAY. Utilizing wet grinding methods, Precision abated approximately 300 square feet of lead coatings on the deck surface in the BOS’N Hole. The second location to be abated included the 950 square foot Lower Motor Room. The scope for this area included blasting the lead containing coatings off the Lower Motor Room port, the starboard sides from the deck plates up as well as the overhead and all stiffeners. The congested, tight corridors added complexity to the project as crews battled the elements to keep the project on task and on time. Despite the difficult working conditions, Precision was able to complete their scope of work safely, successful and more than a week ahead of schedule. Shortly after the project completion in June, the NEAH BAY returned to the water and is currently back to its day to day United States Coast Guard duties. The Great Lakes Shipyard, a division of The Great Lakes Towing Company, operates a full-service shipyard and drydock in Cleveland which specializes in all types of marine construction repairs for vessels, tugs, supply boats, ferries, barges, excursion vessels, dinner boats, research vessels, yachts, and off-side topside work of every kind. The shipyard utilized its new 770-ton capacity Marine Travelift to haul the vessel out of the water to allow for the various maintenance, repairs, and inspections to begin. The Travelift is designed for vessels of this size and is the largest on the Great Lakes in the U.S. and Canada and the third largest in the world. Precision Environmental enjoyed continuing the longstanding tradition of working with The Great Lakes Towing Company and looks forward to teaming up on unique projects in the future. To learn more about Precision Environmental and the assortment of complimentary services offered, check out the Services Page. Environmental remediation of over 1,250 square feet throughout multiple locations of the USCGC NEAH BAY.